Vorkath is a boss encountered during Dragon Slayer 2. After the quest, you can return to fight a significantly stronger Vorkath in an instance on Ungael. Due to the quick kills and ease of travel and banking, as well as the valueable loot, Vorkath is often farmed in a similar manner to Zulrah for profits. 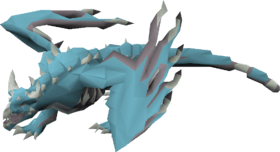 Vorkath can be assigned by slayer masters as a boss task, and as he is also classed as a blue dragon, he can be killed on a blue dragon task with a Slayer Helm for the accuracy and damage bonus. If you do not have a slayer task of either Vorkath or Blue Dragons, you can use a Salve Amulet(e) or (ei) for an accuracy and damage boost. Paired with Void, this method is proving very effective. Using either a Slayer Helm or Salve Amulet(e) or (ei) is highly recommended, but remember they cannot be used together. Most players are killing Vorkath using either a Void Range setup, or a Void Melee setup. Void Melee at Vorkath utilises the Dragon Hunter Lance to take advantage of Vorkath’s weakness to stab. The Lance be combined with a Dragonfire Shield to fully protect you from Vorkath’s dragon breath, however simply using a Super Antifire combined with the Protect from Magic prayer will protect you from most of the damage, which frees up your off-hand to use a Defender and increase your overall DPS. Special Attacks – Void melee at Vorkath without the use of a Dragon Warhammer or Bandos Godsword to reduce his defences is not recommended. You may find the kills simply take too long without them. Using a Restoration Pool in a player-owned house in between kills will allow you to go into each fight with 100% special attack energy. Filling your pouch with Dust runes, Chaos runes, and Law runes will allow you to cast both ‘crumble undead’ and ‘teleport to house’. Void Range at Vorkath utilises the Dragonhunter Crossbow to take advantage of Vorkath’s weakness to ranged attacks. The Dragonhunter Crossbow is by far the most effective weapon against Vorkath and anyone looking to grind Vorkath for any significant amount of time should consider this method. This method is more reliable as it doesn’t rely on hitting Vorkath with any defence-reducing special attacks. Bolts – The best combination of Bolts to maximise DPS at Vorkath is to use Dragon Ruby Bolts (e) for the first 50% of the kill, followed by Dragon Diamond Bolts (e) for the remainder of the kill. Special Attacks – You should use the special attack of the Toxic Blowpipe whenever you need a bit of extra healing.